Hypotensive episodes are common during anesthesia, and controlled hypotension was once even a popular technique for reducing blood loss during surgery. However, because of the unpredictability of cerebral and other organ damage resulting from hypotension, most modern anesthesiologists employ controlled hypotension very sparingly, or not at all. So what are the facts? How should we view hypotension occurring during anesthesia? This requires a careful examination of basic physiology, experimental studies, and case reports. One of the major determinants of blood vessel resistance in any tissue is the external pressure exerted upon the capillaries and blood vessels that tends to collapse the blood vessel. When the intravascular pressures drop below these critical pressures, the flow of blood through these organs ceases totally. Tissue pressures are known for some organs. However, there are some people who say, "Aha, it's all very well to talk about blood pressure, but it's flow that's important, not blood pressure!" I consider statements such as this - statements revealing of a spectacular total lack of insight. Dogmatic statements like this are stinking cesspits in the jungle of willful ignorance. Flow is important, but a flow of blood only occurs because of an arteriovenous pressure difference, and because venous pressure is low, arterial blood pressure mainly determines this pressure difference. However, there is more than one reason for low blood pressure. Hypotension in non-septic, and non-hypothermic persons can be divided into two basic groups. Hypotension due to vasodilatation. Hypotension secondary to vasodilatation occurs due to the effects of vasodilator drugs such as ganglion blockers, sodium nitroprusside, nitroglycerine, etc. Baroreflex increases in cardiac output to sustain normal blood pressure are insufficient to sustain a normal blood pressure, and hypotension occurs. Tissue flow under these circumstances is well maintained, and tissue hypoxia occurs seldom if adequate precautions are maintained. However, the brain, the eyes, and the heart will become ischemic if the level of hypotension is low enough, or if the technique is carelessly applied. For example: brain ischemia occurs during excessive hypotension (Finnerty 1954), actual ischemic brain damage occurs if this is continued long enough ( Brierley 1962, Pasch 1986), ischemic retinal blindness also occurs (Papadonikolakis 2008), as can myocardial ischemia (Lieberman 1983). Hypotension due to low cardiac output. Hypotension due to reduced cardiac output secondary to blood loss, heart failure, cardiac valve disease, abnormal heart rhythms, absence of normal baroreflex activity as occurs in diabetics or those ingesting beta-blockers. In such situations, the cardiac output is simply insufficient to sustain normal blood pressure. This is a situation in which tissue ischemia is likely to occur, because tissue blood flow is poorly maintained. People in this type of situation are likely to develop cerebral, ocular, myocardial, or renal ischemia. The preceding paragraphs reveal that hypotension does not have the same pathophysiology. However this discussion does not provide any usable practical information to guide the practical anesthesiologist. So let us look at the results of experiments where the effects of hypotension upon cerebral blood flow and the threshold of cerebral ischemia were determined. The best studies were reported in 1954 by Finnerty (Finnerty 1954), and by Harmsen in 1971 (Harmsen 1971). The design was simple - young and old experimental subjects were subjected to increasing degrees of hypotension until clinical signs of cerebral ischemia manifested, such as yawning, fainting, confusion, inability to perform simple commands, nausea, dizziness, and involuntary body movements. The graph above was constructed with data from Finnerty 1954 and Harmsen 1971, and clearly shows a linear relation between pre-hypotensive blood pressure, and the level of induced hypotension inducing clinical signs of cerebral ischemia: yawning, sighing, staring, confusion, inability to concentrate, and inability to carry out simple commands. 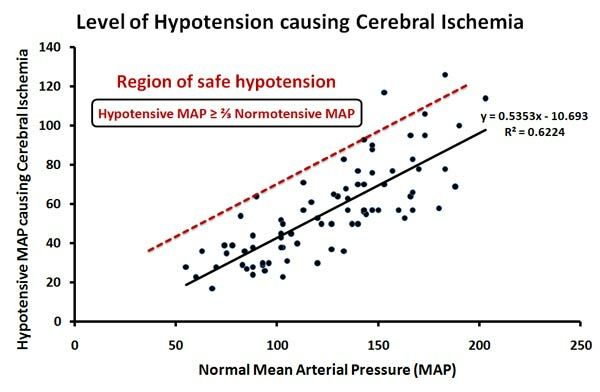 The regression equation in the graph is useless for clinical purposes, because to use this as the limit for acceptable induced hypotension implies that half the patients would develop cerebral ischemia. The red colored line denotes a level of hypotension above which none of Finnerty and Harmsen's experimental subjects developed cerebral ischemia. These data reveal that the safe level of hypotension is no lower than about 2/3 of the resting blood pressure before inducing hypotension. Mean arterial blood pressure (MAP) is calculated with the formula below, where SABP is the systolic arterial blood pressure, and DABP is the diastolic arterial blood pressure. The clinical and electrophysiological manifestations of different degrees of induced hypotension are shown in the table below (data from Finnerty 1954, Trojaborg 1973). These are thresholds and averages for awake and anesthetized persons. But how can they be applied during anesthetic practice? Hypotension during anesthesia - Safety First! General anesthesia generally reduces the cerebral oxygen consumption. This explains why so many people fail to manifest any cerebral damage resulting from the inadvertently profound episodes of hypotension occasionally accompanying induction of anesthesia. However, general anesthesia does not always cause a constant and profound degree of reduced oxygen consumption, because the degree of oxygen consumption reduction may vary during a single period of general anesthesia. Moreover, many patients undergo operations under regional anesthetic techniques where there is no reduction of cerebral oxygen consumption. So the practical and safe advice is to treat all patients in the same way - use the thresholds for minimum blood pressure as developed from the studies of Finnerty and Harmsen (see above). True, these are conservative, but they are safe. Always remember, that although cerebral blood flow and organ blood flow are actually the important parameters, we cannot measure these things, but we can measure blood pressure. This is fact, while measurement of cerebral, or other organ blood flow is a futuristic dream at this time. Accordingly, the practical practice guidelines for hypotension during anesthesia can be listed as below. Carefully examine the chart of the patient for blood pressures measured during rest. The lowest of these blood pressures is the lowest resting blood pressure of that patient during which no cerebral, or other ischemia occurred. This is a safe blood pressure for that particular patient. Use this to calculate the resting MAP. Patients with known carotid stenosis, known valvular disorders, known heart failure, known fixed cardiac output, and known severe coronary artery stenosis should not be subjected to hypotension. These patients may well develop cerebral or myocardial ischemia. So maintain these patients at their normal blood pressure if possible. A safe blood pressure for patients without any of the above conditions is to keep the blood pressure at a level equal to, or higher than 2/3 of the known resting mean aretrial blood pressure (MAP). Patients in semi-reclining or sitting positions are at especial risk. Always remember that the blood pressure decreases 2 mmHg for every 2.5 cm height above the point of measurement. So blood pressure within the brain reclining or sitting patient under anesthesia is about 12-16 mmHg lower than that measured at the upper arm. A very practical way of checking the adequacy of brain blood pressure is to simply feel for pulsations of the superficial temporal artery just in front of the tragus of the ear. This position is about the same level as the brainstem. If you can feel pulsations, then there is very likely perfusion of the brainstem, but if pulsations are absent, then the patient is very likely hypotensive with inadequate brain perfusion. Undertake appropriate action to restore adequate perfusion of the brain. We cannot measure cerebral blood flow during anesthesia, so blood pressure, supplemented with cerebral monitors such as the BIS monitor, is all that is possible to measure the adequacy of cerebral blood flow. These practical guidelines and system of thought are based upon this basic reality of current anesthetic practice, and provide safe margins to prevent potentially damaging hypotension.